When it comes to affordable, sustainable housing, you can’t get much greener than earthbag homes. They’re literally made from the dirt beneath our feet, and the process is thousands of years old. According to an article published in Mother Earth News, 1/3 of the world’s population still lives in some kind of earthbag home. Earthbag homes are just plain cool. Because the material is so organic you can create very moving, sensual designs that seem to be part of the natural landscape. Earthbag homes don’t use any kind of wood or steel for the frame or roof. This means that they make much less of an impact on the environment than a traditional built home. Another big reason why earthbag homes are green is because there are no materials to be transported. Usually, traditional homes use wood, drywall, tiles, and shingles from all over the country. But earthbags are made from local dirt, packed in regular polypropylene bags. So, there’s a drastic reduction in pollution since you’re using almost 100% locally sourced material. You also don’t have to worry about off-gassing in an earthbag home. You’re using all natural materials, so there’s no danger of formaldehyde leaching into your home from insulation or other sources. Earthbag homes are also relatively fireproof. Think about it: does dirt burn? Hardly. But lumber sure does. Another cool thing about earthbag construction is how strong these homes are. Think about this: the military has been using earthbag structures for over a century. Why? Because they stop bullets, and they protect people from blasts. Earthbag homes are also very flexible design-wise. They work very well in beehive designs, but you can really create almost any kind of home you want. It’s especially easy to create built in nooks, seats, and archways into the home, giving it a very organic feel. This is also an easy house to build. You don’t need special skills to build an earthbag home. Once you’ve learned the technique, you’re good to go. Earthbag homes are also incredibly energy efficient. According to Eternally Solar, earthbag homes have an insulating quality 9 times that of concrete block walls. They’re also extremely soundproof, and thanks to their thick walls they help control the temperature and humidity in the home. How Much Do Earthbag Homes Cost To Build? Well, that’s a fairly tough question to answer. It all depends on the size of your structure, whether or not you do a dome design (which eliminates the cost of a traditional roof), and how much work you do yourself. 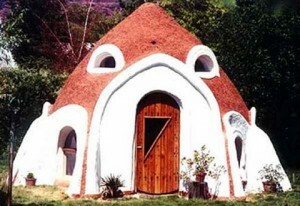 I saw one earthdome home that was 1300 s.f., plus a small guest cottage, that was built for around $23,000. This does not include the price of the land, or the site prep. I saw another small earthdome cottage that was built for less than $1,000. The Honey House, which is the earthbag home pictured just above from Blisstree.com, was built in just 19 days for $1,500. Yowza. I found this awesome design concept at MindesignStudio. 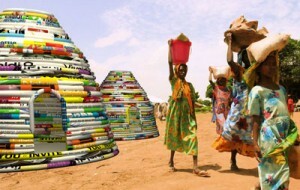 Basically, they’ve figured out that billboard vinyl would be great reused in earthbag construction. These are colorful, simple, and completely green because they’re made with vinyl that would otherwise be throw away. Where Can You Put An Earthbag Home? As far as I’ve been able to tell in my research, you can build an earthbag home almost anywhere. People are building them in the tropics, in the desert, and even in the snowy northern climates. I think if you do live in wet climate, drainage is important. But you can tweak your home design to accommodate this. Want to learn more on earthbag construction? Then here are some additional resources you can take a look at. Earthbag House Plans– This is a great blog with hundreds of earthbag house plans, many of which are free. Earthbag Building– Kelly Hart’s site is incredibly comprehensive; it focuses exclusively on earthbag homes. Highly recommend for further research. Green Home Building– This site has some great information on earthbag construction. Earthbag Building: The Tools, Tricks and Techniques (Natural Building Series) – This book looks like it’s a great resource for learning more about how to build an earthbag home. 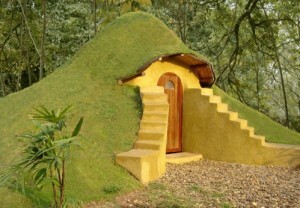 Are you telling me that my dream of living in a hobbit-hole type house is within reach?! Awesome! If I didn’t have my heart set on a building an off-grid recycled shipping container home, I would LOVE LOVE LOVE one of these little homes! I love the earthy, organic shapes. And the fact that they’re so sustainable. This family’s home is SO amazing. And it was so cheap to build! I DID catch that article, and I completely agree with you…amazing. My dude and I probably won’t be finished with inordinate amounts of post-graduate schooling for a few more years yet, but whenever we do finally get to settle down, you better believe these earthy, hobbit like homes will be on my mind! I love these but dont think you can build one in Northern California, at least I havent seen one. I am curious exactly where can you buy land to put one on. I didnt see any mention of plumbing, heat, or electricity, is there any?